The basement of a building at an education facility was deteriorated by soil water which caused sever water leakage from the basement floor and walls. To rehabilitate the basement, a special “waterproof” concrete mix was required. Caltite concrete is a waterproofed concrete which reduces capillary water absorption as well as reduces permeability to water under pressure. Such properties allow waterproof concrete to be used in water-resisting construction below ground in place of water-proofing membranes. The particular mix design has not been used before in Saudi Arabia. Caltite (waterproofing admixture) was used in the mix design to meet the strict waterproofing requirements. Self-compacting concrete (SCC) with a 700 mm flow was the solution for pouring the very thin wall section without vibrators. 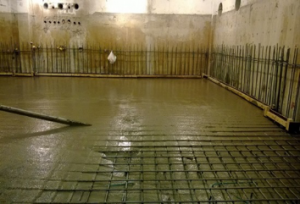 The self-compacting concrete also acted as a self-leveling concrete for the basement floors to ensure easier and faster placing. Extension pipeline systems were used to deliver concrete from the mobile pumps to the basement.